Have you ever thought to organize your media files in categories directly from your WordPress Frontend? Well, we got you covered!! We decided to develop a robust and easy to use extension of the well known plugin “WordPress Real Media Library” by Matthias Günter. While “WordPress Real Media Library” allows the creation of categories and files through the Admin of the Webiste, this add-on shows the category tree with the associated media files directly in any of your Website page. All done in a very easy way! Why do you need this plugin? Well, when you have to organize documents/media to share with the users of your website or intranet website, and allow them to work directly from the front-end, this add-on is what you are looking for. Copy the main plugin to the WordPress Plugin Folder or simply use the WordPress plugin loader in the Admin panel. Create a new page and add a shortcode widget: enter the name build_tree . Save the page and that’s it. On the left side of the page there is the tree structure with its categories and sub categories. You can expand and close the entire tree by clicking on the “+” e “-“ signs respectively. 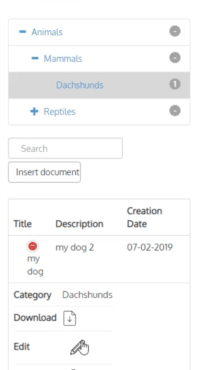 By clicking on the category name, you can see its content appearing in the datatable on the right side: the results are managed with different AJAX calls. The plugin allows the view, insert, update and delete operations. There is a very easy to use a search filter in your files, which works with AJAX calls (without reloading the page). All you need to do is to start typing a character on your keyboard. You can sort your results anytime by clicking on a specific column and the same results are paged, according to a custom selection. Considering the use of the plugin called datatables, the results are displayed in a responsive way: the table properly resizes according to the screen resolution and when some columns overflow, they are set as hidden and can be shown on demand. it requires the WordPress Media library Plugin ( link to the product). WordPress 5.0 / Gutenberg ready. Folders for the WordPress media library. Compatibility with the latest versions of the WordPress Media library Plugin ( from version 4.x). Fast and easy to instantiate on any WordPress page via shortcode. Replicates the exact tree structure as you see in the backend and maintains the sync. WordPress Real Media Library API based. Completely translated in English and Italian languages (further translations on demand). Allows the insert, update and delete actions on media files. Uses Datatables to load the the files without reloading the page (resources linked to CDN). Uses a general search filter on the entire datatable fields. Uses modal windows to insert and update the files. Compatible with many Page Builders (Divi, Visual Composer, etc..). WPML compatibility to organize the media files in the different languages (tested with version 4.2.4.1). GDPR:The plugin is collecting no personal data!